This fine art quality decorative hardware design can also be made as a functional knocker, or even as a door pull. Your choices are limited only by your imagination at ArtFactory.com. This highly detailed custom dragon dungeon key, as pictured, is the perfect decorative accent piece to any of our medieval dungeon style doors. It can also be designed for use as door knocker, or even as a custom door pull. Like all of our hardware products, it is hand forged by our master blacksmiths using pure, solid wrought iron. At ArtFactory.com, every small detail of each product is done by hand. It is the attention to extra details such as the intricately designed wings and individually created dragon scales that make the difference between ordinary, and extraordinary. This stunning work of art will set your door apart from your neighbors, and will make a striking impression on your visitors. The custom dragon dungeon key provides perfect decorative hardware piece for any of our medieval, or castle style doors. It includes a matching backplate/mount with a hand hammered texture. Features like this are hand created, never by machine or cast, so that no two are every exactly alike. This custom wrought iron piece can be added to any door of your choosing, or can be ordered alone and added to your existing door. The custom dragon dungeon key is also ideal for a Dungeons and Dragons, or Game of Thrones themed game room. All of our custom door hardware products are certifed fine art quality, designed and signed by award winning artist H.J. Nick. 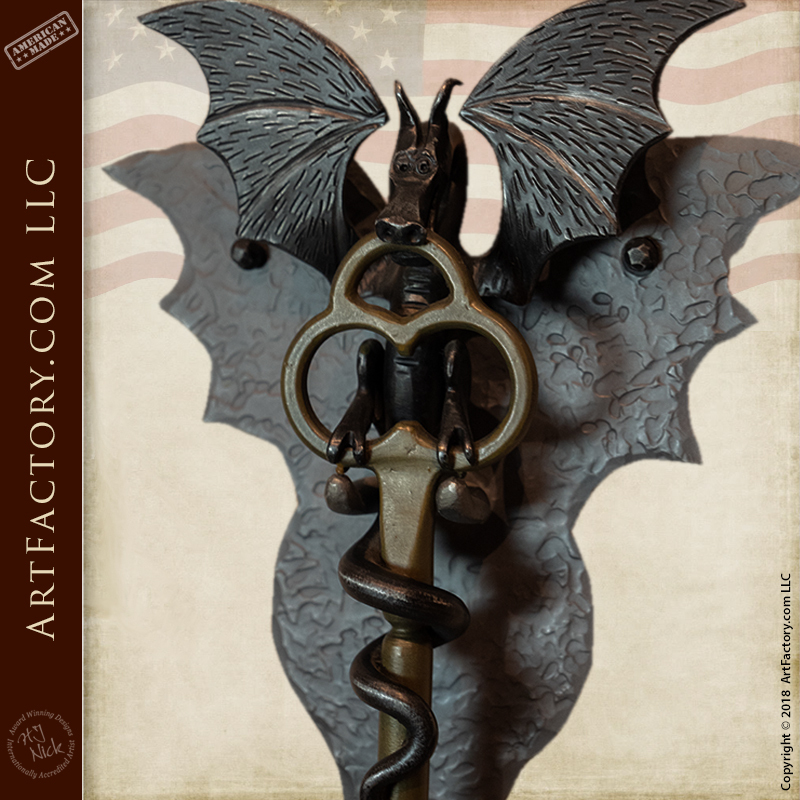 Like all of our hand forged wrought iron hardware, this custom dragon dungeon key is a unique, fine art quality piece. Our classically trained blacksmiths produce each handcrafted hardware item individually. These items are never cast, drop forged, or mass produced. This means that you will be receiving an item that will never be exactly reproduced. Don't settle for low quality, disposable, mass production products when you can own a piece of genuine fine art. We specialize in making items that will become family heirlooms that are passed down for generations. Furthermore, all of our genuine wrought iron hardware is finished with a hand applied, iron oxide, advance patina. This patina is heat applied at over 1000 degrees Fahrenheit so that it will infuse to the metal. What this means is a finish that will stand the test of time and look better with age. Our finishes will never crack, flake, or fade like powders and paints. To top it all off, every product that leaves our factory is certified to meet all world class fine are specifications by award winning artist H.J. Nick. This certification and signature ensures you of a product that is of investment value, and will have future appreciable value in antiquity. Call us today at 1-800-292-0008 for a pricing on our custom dragon dungeon key, or any of our fine art quality products today.